(Nanowerk News) A University of Texas at Arlington electrical engineering researcher is using a federal grant to build a small laser for detection systems to do a more efficient job at spotting chemical and biological agents used for weapons. 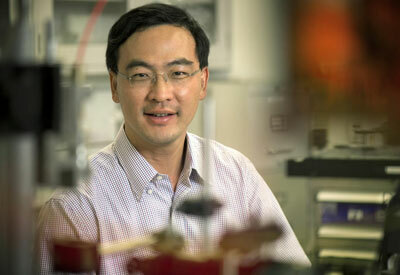 Weidong Zhou, an electrical engineering professor who specializes in nanophotonics, has been awarded $600,000, which is part of an overall, three-year, $4.3 million Defense Advance Research Projects Agency grant to make ultraviolet laser detection more available in the field. The multi-institutional project is led by Michigan State University. Zhou will develop low-cost, compact ultraviolet lasers to detect very small amounts of chemical and biological agents. The goal is to create a new class of ultraviolet lasers that are more than 300 times smaller and 10 times more efficient than current lasers. The resulting technology could be dropped into current detection systems to save size, weight and power or to create new systems that are smaller and more sensitive. "It's like shining a light to find one of these chemical or biological agents. It's like finding these agents' fingerprints," Zhou said. "The Army needs something that's portable." Current laser technologies that use light to determine where agents are present are huge and bulky. They're systems that sometimes require trucks to be transported. "They certainly can't be taken into the field or moved easily," Zhou said. DARPA wants to reduce the size to something a person could carry. The agency wants to reduce the cost, too. Khosrow Behbehani, dean of the UT Arlington College of Engineering, said Zhou's laser technology has applications beyond how the Department of Defense might use the technology. "Dr. Zhou's cutting-edge technology could aid physicians in medical diagnostics through those same ultra-sensitive lasers that detect harmful chemical or biological agents," Behbehani said. "This is a great example of the benefits laboratory research excellence here at UT Arlington can have upon the real world." Zhou said other applications of the new breed of lasers could include advanced manufacturing, secure communications, environmental monitoring and compact atomic clocks.